Splish, Splash, it’s a birthday bash! 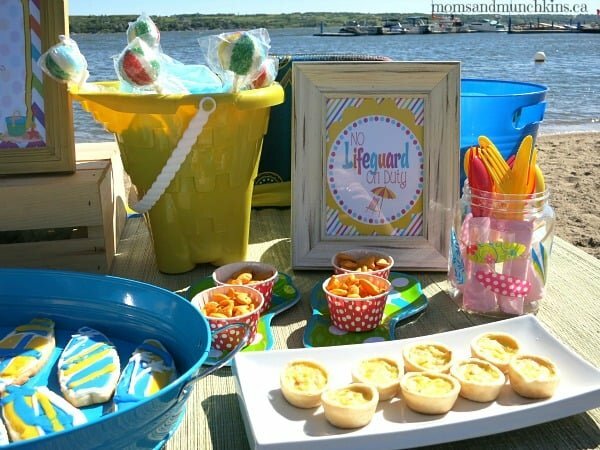 In celebration of the release of Disney’s Teen Beach Movie, I decided to put together some fun beach birthday party ideas that are perfect for both girls and boys. In this post you’ll find ideas for decorations, food, activities and more! We’ll also be sharing some exciting giveaway news so be sure to check that out at the end of this post! 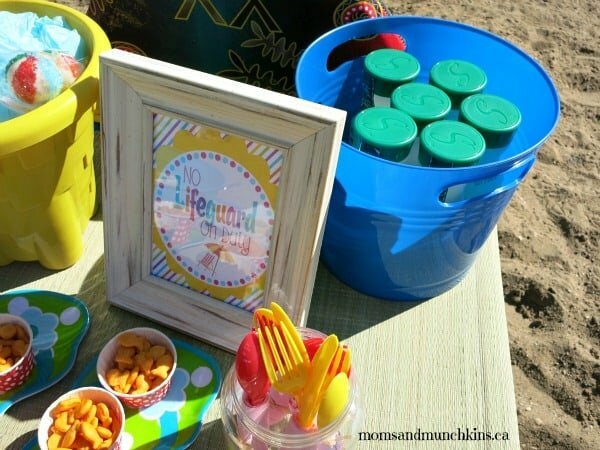 Invite your little party guests to the beach for some sand, sun & fun with an adorable invitation that includes beach-themed items such as surfboards, palm trees, sand pails, water and more. A cute idea for hand-delivered invitations is to send it as a message in a bottle along with a little bit of sand and a mini paper umbrella. Be sure to have an alternate plan in case of rainy or windy weather. The wind was so strong yesterday that it kept blowing my supplies away! Splish, splash it’s a birthday bash! 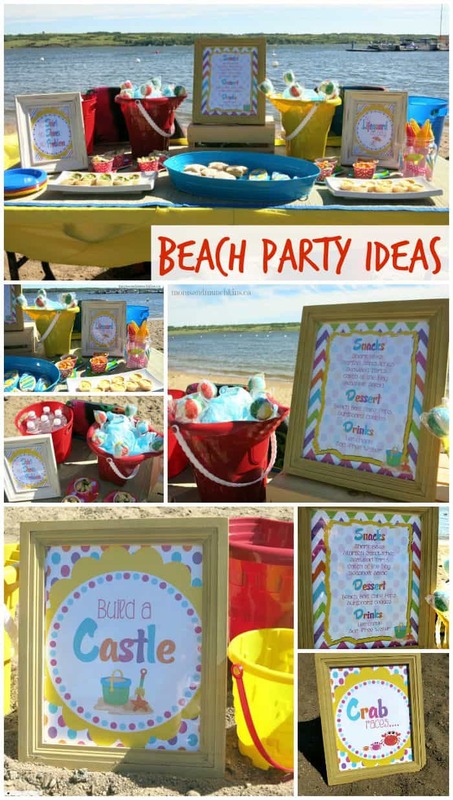 The beach is such a fun place to be so it isn’t tough to think of fun ideas for this party theme! 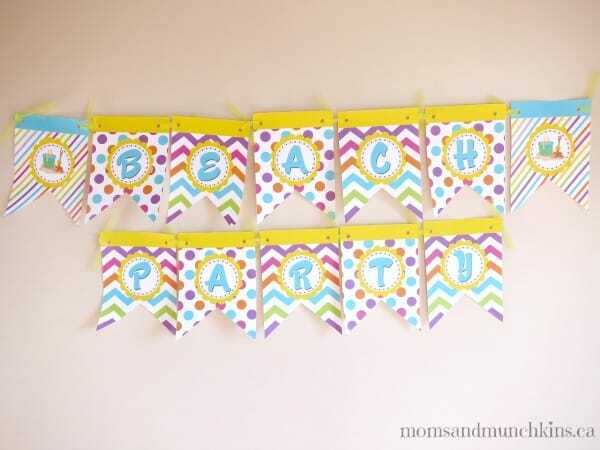 With a beach location for your party, your decorating is already largely taken care of. 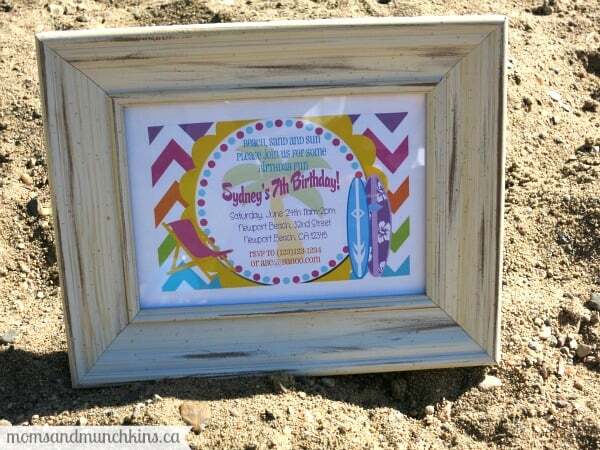 For the party menu and cute signs as part of the decor, I purchased some slightly weathered looking frames. For drinks, I used plastic tubs with ice to keep the drinks cool. 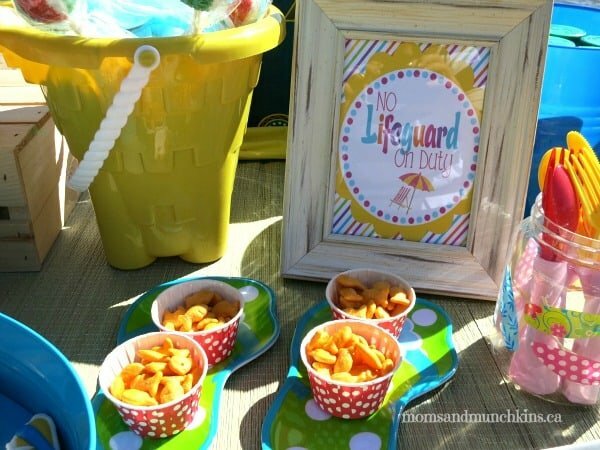 Boogy boards are great to set up behind the table as part of the decor plus they double as an activity for the kids. We purchased these ones at Walmart for $10 each (awesome summer deals going on right now). You’ll find a better picture of these later in the activities section. I used a plastic yellow tablecloth for the table and topped it with a straw beach mat. An adorable & inexpensive idea for a tablecloth! 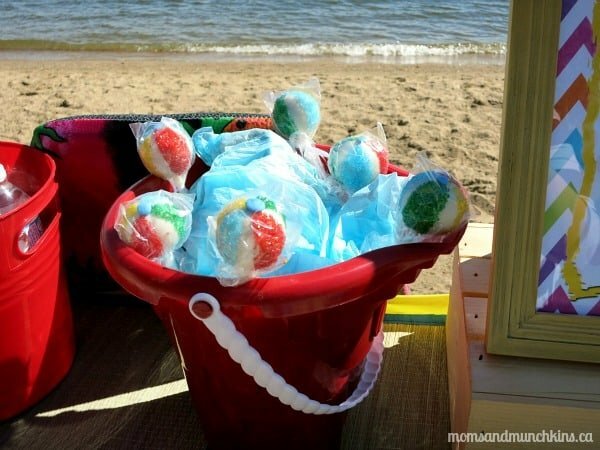 Plastic sand pails were filled with blue tissue paper and beach ball cake pops. You could also use smaller sand pails for utensils and napkins. If it’s a windy day, be sure to put enough weight in them to hold them down. 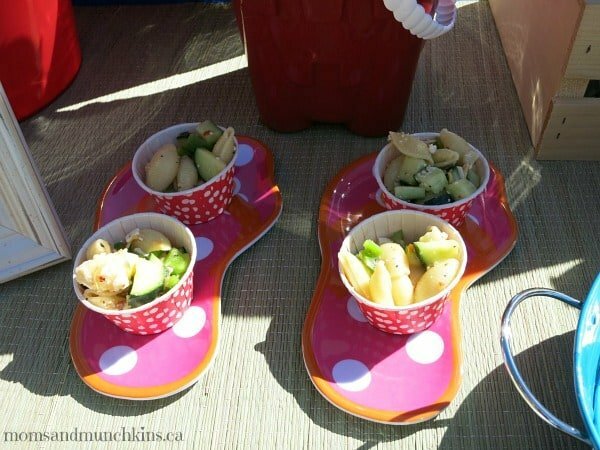 I found some adorable plastic plates in the shape of flip flops that I used to display some of the party food. Old & weathered wooden boxes can also be used as a base for some of the party platters to give them height on the buffet table. There were also a couple of fun signs on the table for “No shirt, No Shoes, No Problem” and “No Lifeguard on Duty”. A small version on a wooden lifeguard’s chair would make the perfect focal point on the party table. The windy weather was not cooperating with my party setup yesterday so I didn’t have the opportunity to use the cute party banner but it makes an excellent addition to the skirt of the party table as well. I love thinking of creative ideas for a party menu. 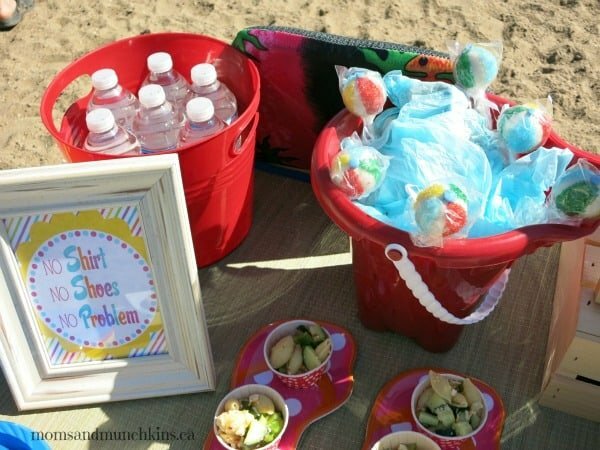 Depending on the supplies you’ll have available to you at the beach, you could plan a picnic, a BBQ or just a few snack foods that the kids can grab in between all of the fun games. 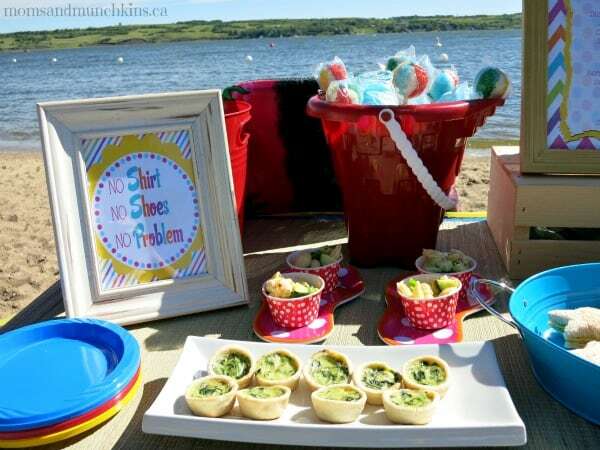 I used wooden boxes, sand pails and large serving trays to display the food. The surfboard cookies featured here are by Baked. The goldfish crackers were served in small paper portion cups – perfect for little fingers! I love mini quiche and they looked cute as “Seaweed Tarts” at the party. Seashell salad was served in mini paper portion cups along with small appetizer-sized forks. My favorite food on the menu were these adorable cake pops that were made by Steph’s Cakes. They were as delicious as they were cute! I used the beach ball cake pops by Bakerella for inspiration – she also includes a tutorial. Lemonade & water (labeled as “salt-free water”) were served in plastic tubs with ice to keep them cool. Another idea for drinks is to serve punch in small sand pails with large straws. For more fun beach-themed food ideas, head on over to Hungry Happenings to look through her large collection of beach-themed foods. They are almost too adorable to eat! When having a party at a beach, playing in the water may be enough to keep the kids busy all afternoon. For some additional party games, here are a few fun ideas that we tried out. 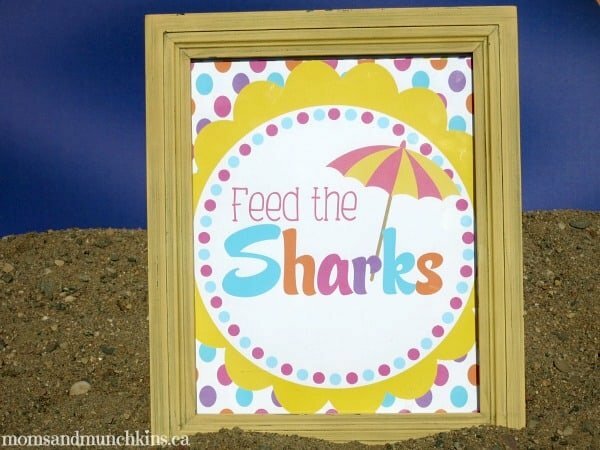 Feed The Sharks: A large shark cut out and some bean bags can be turned into a fun activity for all ages. 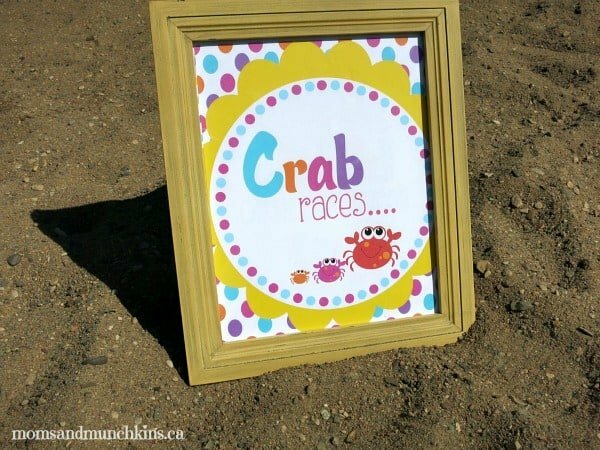 Crab Races: Have you ever tried a crab race? My husband had never heard of it so I had to try to teach him yesterday! Simply crawl with your belly up in the air instead of pointing to the ground. In sand, it’s tougher than it looks! 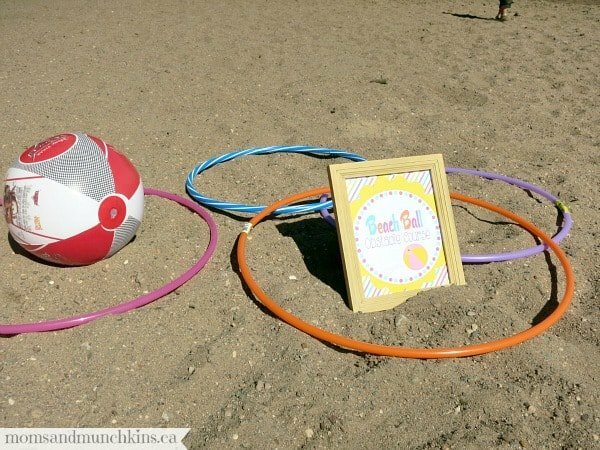 Beach Ball Obstacle Course: A few beach balls, safety cones and hula hoops can be turned into a fun obstacle course with activities like holding the beach ball between your knees while racing through a finish line, throwing the beach ball through a hula hoop target and more! 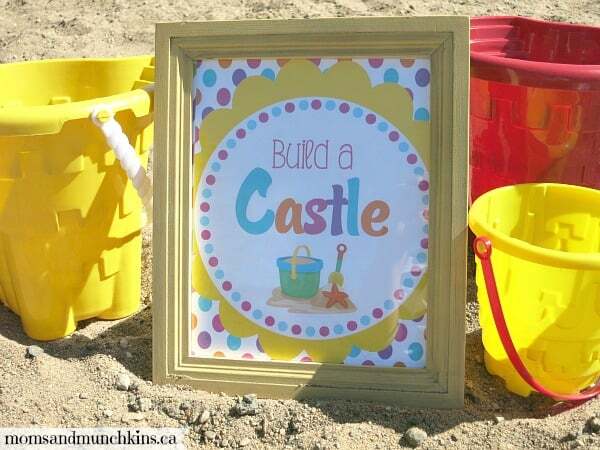 Build a Sand Castle: This is a classic beach activity that all of the kids will enjoy! 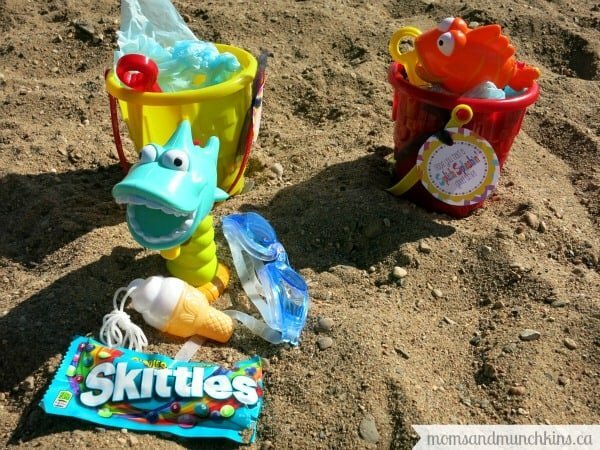 Simply provide a few sand pails, sand molds plus some rocks, seashells, sticks and any other supplies you find on the beach. Catch a Wave: It’s like tag except instead of trying to tag a player, you try to “catch their wave” which is simply a long piece of blue streamer paper tucked into their back pocket. Shark Tag: Like the regular game of tag except this one is played in the water and the “it” person is called the “shark”. 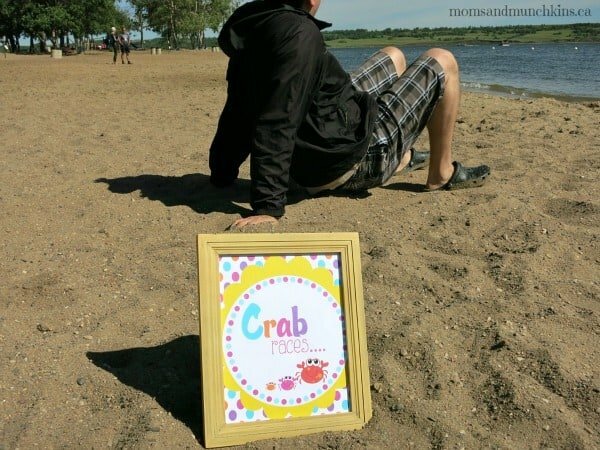 Water Activities: These boogy boards are great for decor and activities. Water toys such as squirters, floating tubes and more can be supplied for the kids to share. Check out your local Walmart store for sales on summer beach items. When planning your beach activities, you may also want to make a note to bring along extra towels and sun block. Top them with a “Hope You Had a Splashin’ Good Time” favor tag and you’re all set! Now onto the giveaway news! 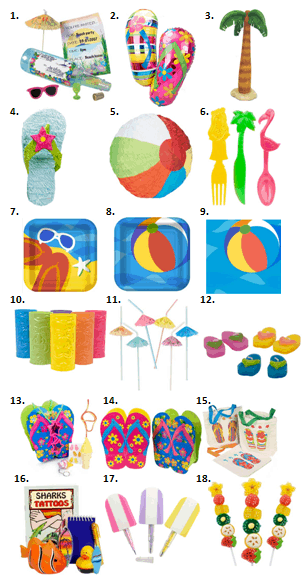 In celebration of the release of Disney’s Teen Beach Movie, we’re giving away a copy of the DVD along with this printable beach party set by Just a Little Sparkle. Head over to the Teen Beach Movie review for more information! *Disclosure: Some of the fabulous products featured in this post were provided to me in return for an honest review. I am part of the Amazon and Birthday in a Box affiliate programs. All opinions expressed here are my own. I have not seen the movie, but my daughter would LOVE this! Yeah, I am going to try to do this for Brooklynn’s birthday, I can’t believe I saw your name on this! Loved this article! 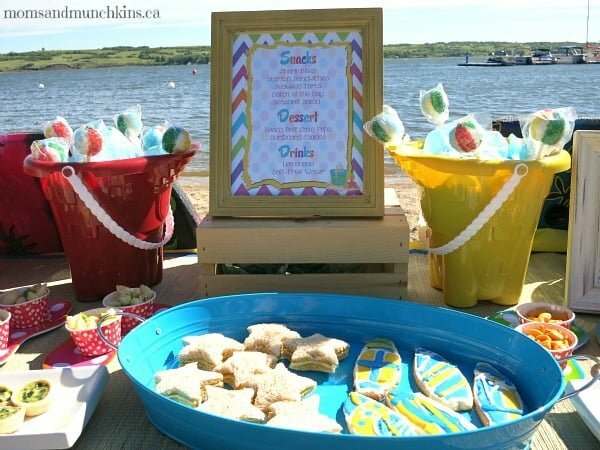 My favourite part was about the games /activities because we’re doing a beach/Hawaii themed party for my daughter’s next birthday and I needed some ideas for activities – thank you! Love the surfboard cookies & beach ball cake pops! i like planning the party and shopping for supplies! My favorite part of the party is the menu. What wonderful names for the food! I’m sure I would have liked the Shark Bites. What a fun party! I love how the invitation and the food list was in a frame, what a neat idea! I love the “build a sandcastle”. I also like how you separated the events/food with frames! Cute! Love the decor and food! I love all the colors. How much fun! I like the mix of chevron, polka dots and lines. Great job! the beach ball cake pops are awesome! It would be great to win a DVD copy of Teen Beach Movie along with a printable beach party set. and leave a comment on that post telling us your favorite part of the party. 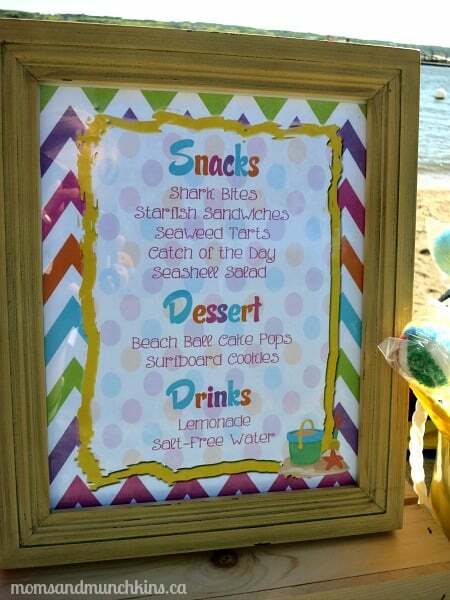 I liked some of the Beach Birthday Party Food. 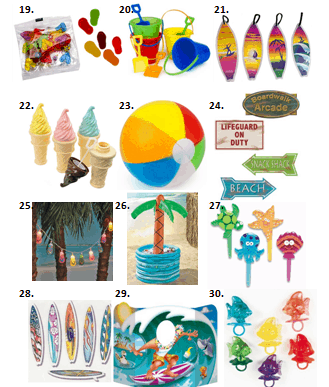 My Favourites are the Beach Ball Cake Pops and Surfboard Cookies. 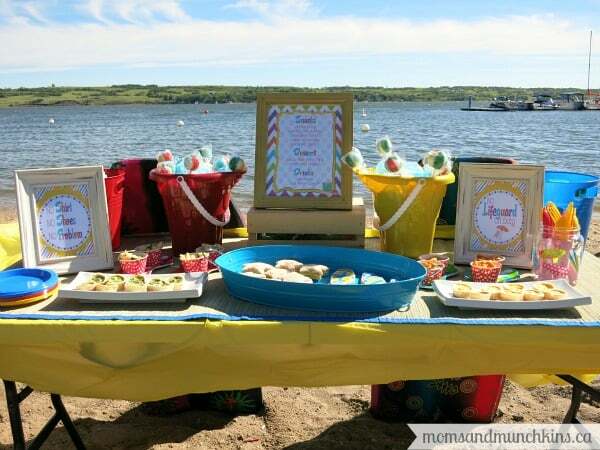 I love the beach themed activities and party favors. The beach ball cake pops are adorable. Thanks for the cute ideas. 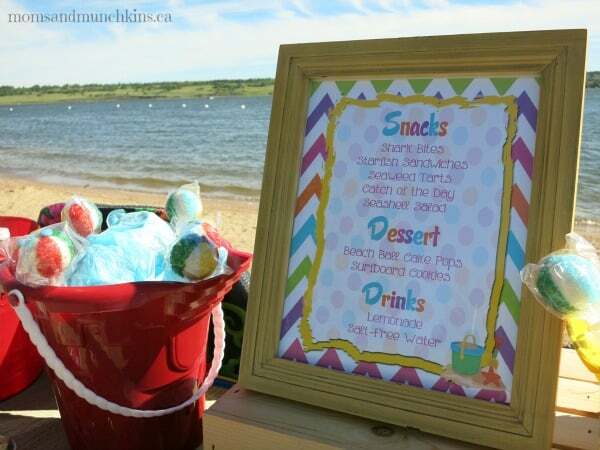 My favorite beach party is the party food.I love the beach ball cake and all other desserts. LOVE the cute signs, the star sandwiches, and the cakepops!! YUM!! The Beach Ball cakepops are so cute! 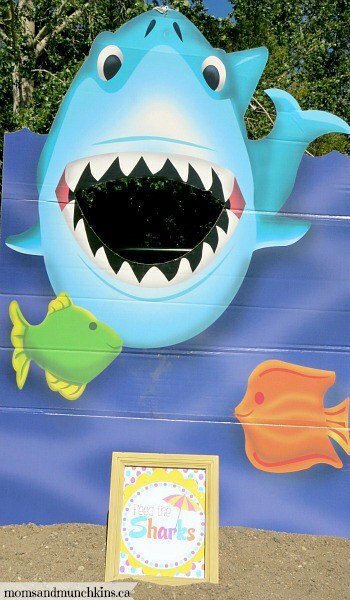 The Shark Bites sound good. Great party ideas! Great party. Love how everything is in frames. cake pops sooooooo cute. I like the food and the activities best!